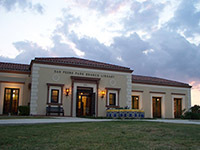 These websites contain information on artists that have exhibited at the library. 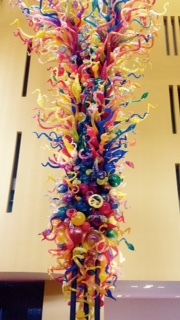 Several of our branches are works of art in themselves. Have you visited these branches for a different perspective on books? An article published by Davis Sprinkle (of Sprinkle Robery Architects) published in the San Antonio Express News, talking about his work with Ricardo Legorretta. Ricardo Legorreta was influential in creating a bright and vibrant symbol of our Library System through the design of the Central Library. Here you will find articles on his architecture. Ask questions, report problems, or just send comments and suggestions. This sculpture commemorates our 100th anniversary as a library system. During the 2009-2010 Weatherization Project, the 917 glass pieces were packed away so this beautiful sculpture would not be affected by construction. The glass pieces have been carefully reinstalled on the metal framework by a project team led by John Landon of JDL Design. 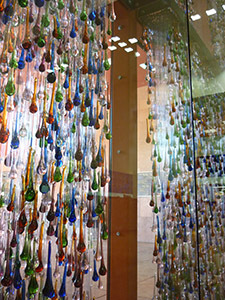 Dale Chihuly's studio has completed more than 100 public installations around the world - we encourage you to learn more about his art by checking out the books below. 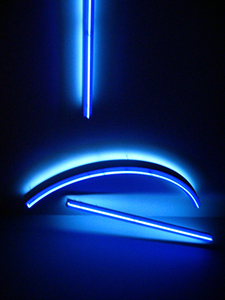 The Blue Room is a neon-art installation which greets visitors to the Library. Antonakos wanted the Blue Room to clearly establish a change of setting from people's daily rushing in and out of buildings. 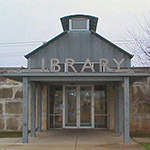 The room is designed to provide a calm, cool and inviting entrance to the Library. 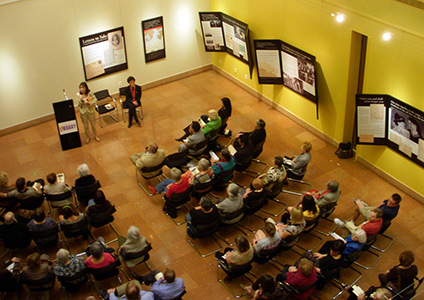 The public artwork commemorates the life of Linda Pace, an artist, collector and philanthropist, who founded Artpace San Antonio, an international laboratory for the creation and advancement of contemporary art. Each of the 22,722 crystals represents one day in her life, and the pieces were assembled over several weeks. Because the subconscious was such an important element of Pace's art, the crystals were chosen randomly. "This placement within the window will allow an exterior view of the work as well as an interior one and will serve as a metaphor for the outer and inner being of sources – the internal and external, the physical and metaphysical, the body and the spirit," said Amado. 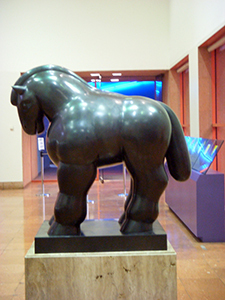 Considered Latin America’s most famous and most beloved artist, Fernando Botero is a painter, sculptor, and draftsman who is known for rounded playful forms and political art. 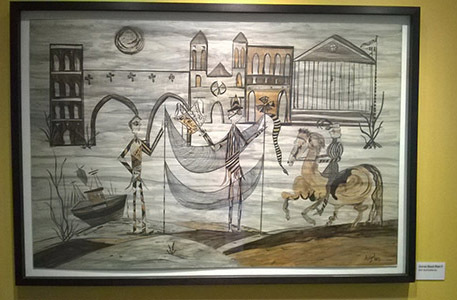 His prolific work is exhibited in public spaces and galleries, and has inspired, challenged and delighted viewers. 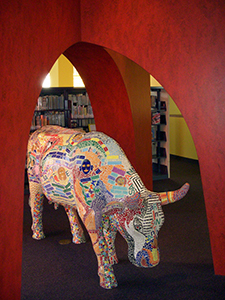 The Young Voices cow was created by the students of the Thomas Jefferson High School Fine Arts Program and given to the library by a group of anonymous donors. Each of the 17 Jefferson High School students who worked on the art piece is represented through the handmade tiles on the body of the cow. 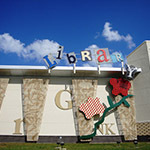 This art piece helps symbolize the library system’s commitment to San Antonio's youth as well as its pledge to support public art and visual literacy. Rogelio Madero de la Peña is a Mexican sculptor who is known for the largest Christian sculpture in the world, El Manto de la Virgen. De La Peña creates monumental abstract sculpture in iron and small-scale sculpture in other metals. His name is synonymous with art, metal and heart. 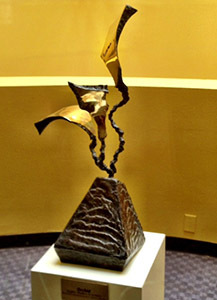 Orchid is an abstract bronze sculpture with three polished curved shapes representing petals raised on a textured triangular base. Sebastian is a renowned Mexico City artist that works with geometric forms in materials of steel, aluminum and cardboard. 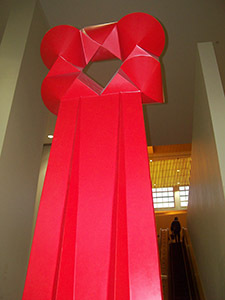 Axis Mundi was created by the artist especially for the Library. Sebastian is also the sculptor of the downtown Torch of Friendship and other local works. Treviño is known for his photo-realistic paintings of San Antonio's Westside community. 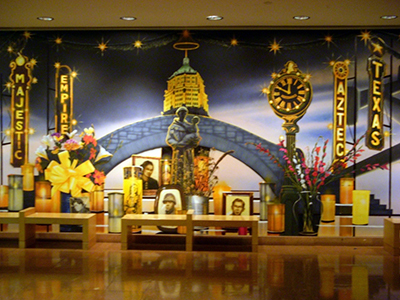 Treviño was commissioned to create a 36-foot mural for the library. The mural is like a time capsule of San Antonio during World War II. It features marquees from local movie houses and the city's largest retail establishments. The altar is another element of the mural, and it is a tribute to those who served in the war. It includes familiar items such as candles, flowers and photos. The photos commemorate all individuals who participated in the war. 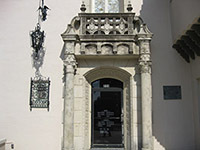 However, some of the people represent famous San Antonians. The woman featured is a likeness of Emma Tenayuca, leader of a labor movement in the late 30's and early 40's, the Hispanic man is World War II Medal of Honor recipient Cleto Rodriguez. The young Anglo male is a likeness of Retired General Robert McDermott when he was a Cadet. 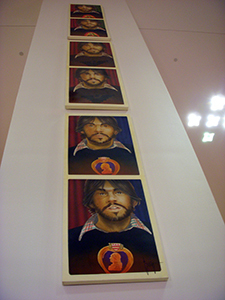 Jesse Treviño’s three-panel self-portrait represents the artist through aspects of his personal relationship with the 1960s. Mexicano is symbolized by the colors of the Mexican flag and an image of Our Lady of Guadalupe. A black Aztec eagle synonymous with César Chávez’s United Farm Workers Movement represents Chicano. The artist’s military service in Vietnam is reflected in the Purple Heart medal heraldry and representative colors of the U.S. flag in Americano. The Art Gallery is open with current exhibits that feature local artists and our community partners. We're also right across the street from the Southwest School of Art. If you are interested in nearby galleries and the downtown art scene, you may wish to check out the Office of Cultural Affairs Arts Calendar on the Art Appreciation page. Dr. Amy Freeman Lee was an educator, artist and author. 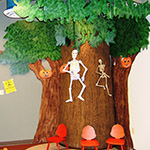 The Children's department at the Central Library is dedicated to Dr. Lee. From 1941 until 2004 Dr. Lee served as Chair of the Judges Committee for the Young Pegasus Poetry Competition. A fabricated pop-up tree and vine. A tile mosaic floor treatment creates a flowing "river" from the entryway and through the building past a landscape mural, ending in a mosaic pool or in the children's area. 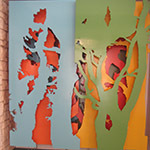 Mixed-media project consisting of a series of artist-fabricated panels. 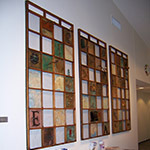 Each panel is composed of a grid-like pattern that contains images and made-objects that reference the library's connection to Kelly and aviation, as well as referring to the library's namesake, Henry Guerra. Working 40-foot windmill of galvanized steel greets visitors and goes well with the rustic architecture and rural surroundings. 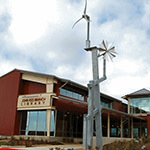 This non-traditional hybrid windmill will harvest power from the intermittent wind source and, through a generator, provide supplemental power to a small water pump, allowing the water to flow down a channel and through the building to a water basin. The design enhancement builds on and elaborates the architects' early design ideas while bringing his own talents and experience with collages and artistic use of letterforms to the design. Rayburn's design successfully expresses the combination of the physical structure of the building and the library's goal of developing an interaction with the natural park built across the street. 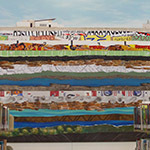 A mixed-media mural hanging in the library "metaphorically illustrates the deep stretch of geological history that lies beneath the grounds." There are also two outdoor sculptures resembling "core samples" of the library grounds—one is located by the entrance and projects the library’s name onto the library; the other is located in the courtyard and seeps water into what looks like the hole from which it came.